I Love Lucy is one of the most iconic sitcoms of all time. It’s a show so well-structured, and so beloved, it continues to air in 2016, even though the last new episode premiered in 1957. It was the first show inducted into the Television Hall of Fame, and multiple publications, including TV Guide and TIME, have named it one of the best television shows of all-time. While I Love Lucy wasn’t the first sitcom, it can be argued that it is the series from which the modern concept of the sitcom stems. 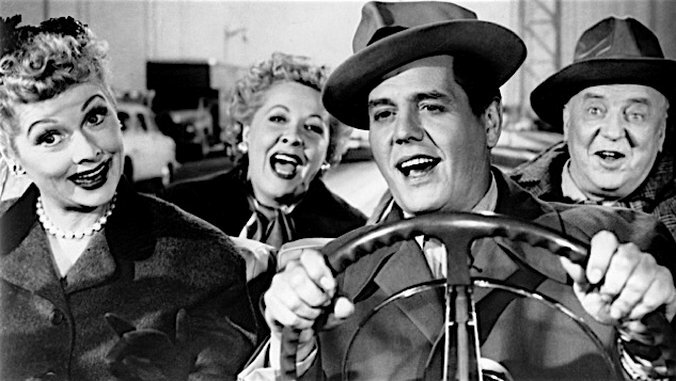 This is not just a matter of how it influenced shows that followed it, although many series have clearly been (and still are) influenced by the wacky adventures of Lucy and Ricky Ricardo. And although Lucille Ball’s pregnancy was worked into the show—a huge point of reference when talking about the revolutionary aspects of the show—it’s a minor point in the grand issue of the legacy of the series. Where Ball and her husband Desi Arnaz really made an impact was in the certain innovations they made in the way television shows were filmed and stories were presented. First off, the fact that Ball and Arnaz got to star in the show was fairly impressive to begin with. Ball had been starring on the radio show My Favorite Husband and CBS wanted to turn that into a TV show with her radio co-star Richard Denning. However, Ball pressed them to let her cast her actual husband Arnaz. Since he was Cuban, this led to some resistance. To their everlasting credit, Ball remained steadfast, and Arnaz was eventually cast on the show. Together, Ball and Arnaz remained determined to bring their vision to television. While they were cajoled into creating a weekly show instead of a biweekly show, they would not bend in other areas. The show’s sponsor, Phillip Morris, wanted them to film the show in New York, which is where television happened at the time. But Lucy and Desi wanted to film in Los Angeles. This was not ideal, because, back then, television, generally speaking, aired live in the Eastern Time Zone, and then low quality kinescopes of those were taken and shipped out west, where far fewer people lived at the time. Lucy and Desi didn’t want to just stay in Los Angeles because it was convenient for them (Ball was pregnant with their first child); they wanted to shoot on film so that the quality would be better, and so that both coasts could enjoy high quality picture. In order to make this happen, they took a significant pay cut, and took on the role of producers through their new production company, Desilu. Shooting on film was notable, but not completely unheard of. Those kinds of shows were single-camera, with a laugh track tacked on (laugh tracks were essentially a given). Ball, however, was one of those performers whose strengths lay in playing off the energy of a live audience. As such, Lucy and Desi decided to shoot on film in front of a live audience, which took a lot of finagling. For example, they had to complete serious renovations on their studios just to be compliant with fire laws. The decision to use three cameras was also significant. Other shows had used multiple cameras before, including Amos ‘n’ Andy, but they didn’t have live audiences. In this way, what I Love Lucy was doing was basically unheard of. They were reinventing how sitcoms were made. Of course, as you probably know, this became the standard means by which sitcoms were shot, by and large, for years. Desilu and the success of I Love Lucy marked the invention of the multi-cam sitcom as we know it. The people who worked on the series were the first to figure out all of the kinks and ultimately making this whole system work. Shooting television became so much simpler and quicker, and allowed the actors to play off the audience. Most of the classic sitcoms of the bygone era—the ones that made guys like Jim Burrows household names—were building off of what Ball and Arnaz did. Even shows like The Big Bang Theory, the most popular sitcom going today, are multi-cam sitcoms shot in front of a studio audience. This approach wouldn’t exist without the work Ball and Arnaz did—and they did it in 1951. I Love Lucy also played a major role in what would become a staple of the sitcom genre. As previously mentioned, Ball got pregnant while working on the show, and they worked her pregnancy into the plot of the series. But before doing so, Ball, necessarily, needed to take some time off. Unable to fill a full year’s commitment of episodes, Arnaz and producer Jess Oppenheimer decided to rebroadcast some old episodes. This proved to be a great ratings success, and essentially gave birth to the rerun, which, in turn, led to the concept of syndication. Not too shabby for a decision born out of necessity. As a direct result of I Love Lucy, television production has never been the same. Ball and Arnaz were willing to completely reinvent the way sitcoms were made in order to live their personal lives, and produce their show the way they wanted. I Love Lucy hasn’t been forgotten yet (we’re still watching old episodes), and may never be forgotten. But, even if the generations to come don’t get to experience the magic in the same way that some of us have, the legacy of Ball and Arnaz, and how they made and re-made television, will always be apparent.